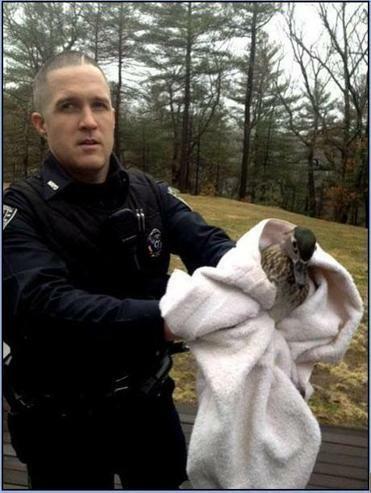 North Reading police Officer Greg Connolly corralled and released a duck that flew into a home near Swan Pond Saturday, April 5. A North Reading resident called police fearing someone had broken into her home Saturday, and indeed officers found that an intruder had come in through the chimney. No. It was a duck. A female wood duck, to be precise, covered in soot from her misplaced descent. The resident had been woken up by what she described to police as loud, banging noises coming from downstairs, police said in a statement. Alarmed, she called police from the upstairs bedroom. Officers were unable to find signs of a break-in, but searched the house and ran into the feathered intruder. They surmised that the duck had flown in through the open chimney then bumped into a ceiling, the evidence for that being a what police described as a silhouette of a duck in soot. Officer Greg Connolly cornered the duck and released it, unharmed, at nearby Swan Pond.